Yes, yes yes… It’s about time! I won’t be mentioning any spoilers as I assume most people have seen the movie already since this review is “past due” IMHO, and you don’t need to be re-told what happens. However, I wanted to focus a bit on the undertones of the film. Ok cool, thanks! This film caught some heat from those who believed there were strong racial undertones. This, I’m assuming, is in regards to the “Predator vs. Prey” theme threaded throughout the film, which felt very familiar as our social issues between race vs. race, or perhaps religion vs. religion. While the topic is certainly heavy for a kids movie starring a bunny cop, I definitely felt that fourth wall disappear on a couple of occasions while watching the film. Whether it was the intention of the writers on not, I actually approve of this “hidden” plot line. Taking infamous enemies such as a fox and a bunny and using that connection as an analogy for prejudice was not only a perfect call, but overdue in my opinion. The reason it worked so well is because of the characters themselves. Judy Hopps (voiced by Ginnifer Goodwin) and Nick Wilde (voicef by Jason Bateman) had some amazing chemistry. And while this isn’t a love story, the evolution of their friendship was extremely believable. Judy Hopps comes from a small town, where the community appears set in their ways. Her dreams of being a cop strikes a cord with her town, including her parents who believe in having “realistic” dreams. It’s a great scene when the two parents are trying to explain that she should actually not try, and stick with what was normal, AKA acceptable or expected of her. Hopps’ resilience is catching as she works hard to prove herself, and her hard works pays off! In the end, she defeats all odds, silences the naysayers, and becomes the first ever “bunny cop”. She is assigned to work in the heart of Zootopia, a mega-city full of diverse landscapes and bustling with animals from all walks of life. Of course, Hopps is not the most popular rookie on the team, and while she starts off full of fanciful dreams of saving the world, she is quickly pulled down from that dream as she realizes that her assignments are rather menial. Her vigor leads her to volunteer to find a missing otter, against her Captain’s orders. She basically bets her career that she will find him. It’s an impulsive mood, especially considering that the file on Mr. Otterton is practically non-existent, and, Hopps has little to no resources. Stuck between a rock and a hard place, Hopps has no choice but to swindle herself a sly fox that she had previously met. Enter Nick Wilde! The two could not be more different, but as they move through this crazy search together, they realize that they have both suffered lifelong judgments based solely on their appearance. Wilde decided as a child that if people expected him to be a certain way (a sly fox), then that was all he would be. Interestingly enough, Wilde does possess a strong trait of being unusually clever. Hopps points out how his cleverness could be a useful tool and he would make a great cop. It’s a great moment, because Wilde accepts that there is more to him than he ever thought. Also, he shouldn’t be ashamed to be “clever”, because it was something they needed to solve the case! There is a lot of focus on working hard for what you want, believing in yourself, and, not judging a book by its cover. The lessons in this movie are amazingly taught. But beyond the lessons we get from this movie, it’s also just a hands-down wonderfully funny and visually beautiful film, filled with excellent Easter eggs as well! I can’t say enough good things about Zootopia! The plot moves along and doesn’t drag out. You get super involved with the characters, too. I especially love watching the little hamsters with their little suits on OMG!!!! SO cute!!! But I digress. This film has heart, and the moment the credits began to roll, I honestly debated with buying another ticket and watching it a second time. Not to mention, I did see the movie for the first time while at Disney Springs, so hello major Disney-ness! You’re just going to love it, I promise! Zootopia is also available on Netflix, so really there is no excuse to not check out the movie. And if you’ve already seen the movie, please tell me what you thought of it! This weekend was chock full of Disney movies, mainly because I was super sick with my FIRST COLD OF THE SEASON! I found myself reaching for some strong, empowering female-lead movies as well. Not sure why, but anyways, Princess Merida from Brave is a great “spokesperson” for this role! Her whimsy and independence are truly endearing. Merida, you rock! Hurricane Matthew is making a mess down in Florida, and as we speak, the Walt Disney World theme parks are shut down and preparing for the storm. Folks on vacation at the magical land must be disappointed to miss visiting the parks and the MNSSHP events, I would be! 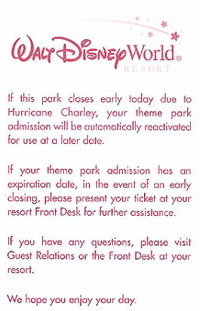 Some comments have been made that it’s risky to travel to WDW during hurricane season, however, it should be pointed out that it is a truly rare occasion that the parks have to close due to the weather. Hurricane season in Florida runs from the end of June to November, believe it or not! But since opening in 1971, the parks have only been closed because of the weather a few times. Hurricane Floyd rushed through in 1999. and this caused the all four parks to close down for the first time in WDW history! And then in 2004, which was a crazy hurricane season in Florida (I know, I was there for Hurricane Charlie! ), the parks saw a few different full-day closures. My trip wasn’t interrupted, however, we were leaving the day it got really bad. But I remember seeing the cast members, all calm and collected, as they had to prepare to shut down some of the attractions. Obviously the rides that are outside get shut down first. Being in Florida during a hurricane can be unbelievably nerve-wracking! In 2004, during Hurricane Charlie, my family and I were staying with my grandmother who lived in Kissimmee at the time. We were there to help move her up to Boston so should could live with us. Of course, my family planned a couple of nights at the Walt Disney World parks, and, we actually stayed at the Grand Floridian Resort! That resort is absolutely GORGEOUS and I remember feeling very posh and important whenever I walked onto the property! Anyways, Hurricane Charlie rushed in, and my whole family (including the dog) had to bunker down in my Grandmother’s pantry! It was crazy. There was six of us all huddled together in an 8×8 room, holding hands, praying, and panicking. The destruction was craziness! My Grandmother’s trees were pulled from the ground, roof shingles were littered all over the yard, but the worst thing was the weather afterwards. Obviously, we had no power, and the humidity was super oppressive. Without AC, we were getting pretty snippy with one another. Also, we were packing a house full of things by candlelight, mind you, so it was just awful! I remember the need for ice was also in high demand, and the lines… oh my GOODNESS the lines to get ice, gas, just the necessities. It was completely surreal for a New England gal like me. Don’t get me wrong, we have our Nor’easters to contend with. But to be honest, it’s easier to make a fire and warm up then go without the use of a fan or AC. Horrible. While I understand that Central Florida does not usually get hit by this Hurricane Season, having lived through one 10+ years ago, my thoughts go out to everyone who is being affected by this right now. I hope that proper aid and help comes swiftly, and everyone remains safe. October!!! I love October, it’s my second favorite month in the entire year (following December, of course)!!! So many awesome great exciting things happen in October, especially up here in New England. It’s cool, beautiful, comfy, rejuvenating, and sometimes just a little spooky! We got the Salem Witch Trial thing up the road, we’re known for being the location where Hocus Pocus was filmed, and it’s easy to believe that mischief and mayhem can occur on our cobblestone streets littered with colorful leaves. *sigh* It really is beautiful right now. To get in the mood for the “mischief” October brings, I decided to find out What My Disney Villain Name was, by checking out this quiz.